"So simple, so good! Have tried several different combinations of spices, but keep coming back to this one. 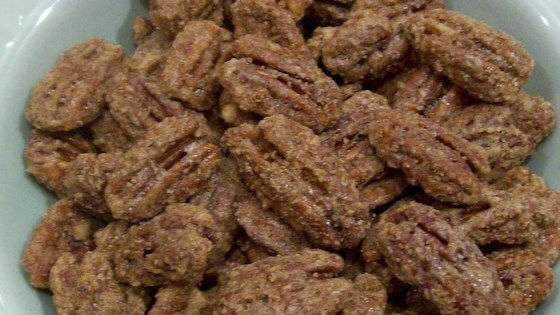 I use only pecans, but mixed nuts would be fine." Preheat oven to 350 degrees F (175 degrees C). Line a baking sheet with aluminum foil. In a small bowl beat the egg white with the water. Stir in the pecans, mixing until well moistened. In a small bowl, mix together sugar, salt, cinnamon, cloves and nutmeg. Sprinkle over the moistened nuts. Spread nuts on prepared pan. Bake in preheated oven for 30 minutes, stirring once or twice. Be careful not to overcook and burn the nuts. Learn how to make this quick and easy, sweet and savory snack. This recipe is the BEST! I've used walnuts as well, with similar success . . . and the most wonderful aroma fills your home as a result -- which is especially nice over the holidays!